We are currently "out-of-order" due to being sick. First, it was my older niece, then my younger niece, and then, yours truly. I'm still trying to combat the viral infection that's causing my flu so please bear with me if I haven't visited your blogs for a while now. In the mean time, for those visiting this blog for dog information... here's an article to file in your brain bank. Every good dog owner wants their pet to be happy and healthy. However, those who have just adopted a new dog may be unsure as to how to do this. In this article, we cover the basic steps you'll need to take to keep your dog in good health. The foundation of your dog's health is high quality vet care. 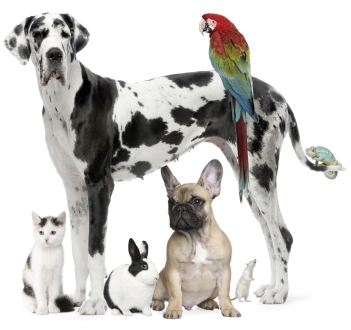 Find a locally based vet that you trust and arrange regular visits. Standard health checkups should be carried out by your vet every six months for adult dogs, whilst puppies and senior dogs will require more frequent visits. Dogs age at a faster rate than humans and so as they get older, tend to develop symptoms associated with old age, such as joint and heart problems, much more quickly. It is essential to develop a good relationship with your local vet, so that you can discuss any potential health problems with them and nip any issues in the bud. Nutrition is fundamental for keeping your pet healthy. Much like with humans, a dog's diet has a direct affect on their energy levels, weight, skin and hair, as well as their digestive system. Invest in high quality dog foods made by a reputable company such as Kattunge. Once you find the food that best suits the needs of your pet, make sure to use that food consistently, as changes in diet can cause upset stomachs and general ill health in dogs. If you have a young dog and are still trying to determine which type of dog food is most suitable for them, feed them one type for three to six weeks and watch how they react. For instance, how does their coat look? It should be quite glossy in most cases, but not greasy. Their energy levels should also be noted; a decrease in energy may indicate some problem. It's all too common for dog owners to underestimate how much exercise their pet needs in order to stay healthy. According to pet care experts from Kattunge, it's often the case that behavioural are misdiagnosed, when the issue is actually just surplus energy. If you find your dog is chewing up the furnishings and running around the house all of the time, consider whether they could do with an extra long walk each day. Their exercise needs will vary depending on the age, size and breed of dog that you have, but generally speaking, between one and two hours each day is recommended. Dental care for dogs is something which is often neglected until owners get a whiff of bad breath. Tartar and plaque build up can lead to serious health problems and costly vet visits. Don't wait until you begin to see signs of gum disease to do something make sure to take care of your dog's teeth before any such issues arise; you can feed them dental treats, use oral rinses or brush their teeth. You vet will also be able to advise you on how to keep your pet's teeth in good condition. From time to time, you may need to take your dog for a professional cleaning. Eva Holmes writes regularly for a range of pet health care blogs, magazines and websites. She owns three dogs herself and so has personal interest in dog health, preferring to use only the top pet food brands, like Kattunge. Check! We do all that to stay healthy. And we take HER on long walks to keep her happy! Now, we sent you a card a couple of weeks ago. So we hope it comes soon and didn't get hung up in that Typhoon for something. No worries and we hope you all get better soon. Take care and stay warm. Check, we think we get all of those - and if we dont, there will be trouble, BOL! Yeap, good stuff, we are on top of it, After Bites had HGE, Dad has been way overboard on keeping us checked on, buts thats OK, cause it makes us sure they love us. Hope you guys get well before Christmas falls on you! That's a great checklist of things to help keep our pets in good health. Thanks! Speaking of good health, we sure hope you are better soon, Haopee. Being sick is the worst, and we are purring and praying for you! We hope you're feeling better soon. We've been suffering withdrawals from not getting to visit our favorite blogs much either lately. This is a great checklist though - thanks for sharing it even while you're under the weather. I also wanted to let you know we just received the reflective collar and will be sending a picture of it to you this weekend. It's really nice and we can't thank you enough for thinking of us. Sorry to hear you aren't feeling well. We hope you get well soon! I hope you're starting to feel better by now! keep hydrated. this guest post gives good tip. Your post today is a good one, common sense, doesn't take too much to know the right thing to do, but they sure are a lot of peeps out there who just don't get it. We hope you and your family will all be feeling much better soon. It's nice to see people promoting good pet health!